You’d think I’d have appetizers on the brain like all of the other food writers because of the Super Bowl this weekend. While what we’re making certainly qualifies as game-day delicious, I’m thinking of them for other reasons entirely. Instead, I’ve got wedding on the brain. Brother Tom and the lovely Amara will marry this weekend in Minnesota, a wintry, silvery, luster of a time made that much more beautiful because the two of them are so authentically happy together. 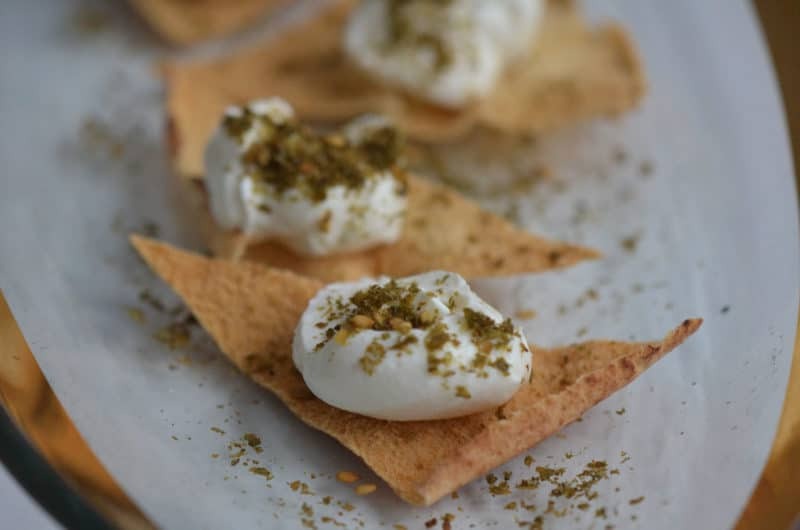 When they first started planning the event last summer, there was a lot of talk about the Lebanese food and how it would make an appearance on the menu. They landed on having the cocktail hour with miniature versions of the Lebanese dishes we love: little lemony grape leaf rolls, fried kibbeh balls writ small with tahini sauce, fatayar (soft dough stuffed with spinach or meat), and pita crisps with a dollop of labne and a sprinkling of za’atar. Last spring when I was working at Boulette’s Larder in San Francisco, some evenings I worked the private parties that are held in the restaurant space—enchanting dinners with food that sent me swooning and an ambience made that much more magical by the twinkling lights of the Bay Bridge just outside the door. As the violet hour descended the chef offered me a small glass of wine even though I was just kitchen help, and there in the twilight with the heady scents of truly exceptional cooking swirling about, I took a deep breath and felt life was very good indeed. Chef Amaryl made gorgeous hors d’oeuvres for those dinners that included some of my contributions to the kitchen while I was there. The day I made kibbeh balls (“lamb boulettes” is what she called them on the menu) we used the extra meat mixture to make melon-scooper-sized fried balls for one of the elegant appetizers that evening. Skewered on special carved toothpicks and served with a tahini dipping sauce, the kibbeh was a huge hit with the guests (who, by the way, paid dearly for those dinners). Another night she had me slice the talami I had made that was left from earlier in the week into very thin, long slices and toast them to make a cracker (a real challenge, believe it or not, to get them toasted to perfection—not under, not over). Then we slathered her own rich labne on one end of the toast and sprinkled her house-made za’atar over it. Brilliant!! I wasn’t feeling so brilliant about the scene, though, when it was fava bean season and I was given the task of blanching a motherlode of them, then peeling them, all on a tight schedule. The pressure was terrific. So when it came time for Maureenie to pony up with recipes for the chef for the nuptial dinner, I thought immediately of the way we served the Lebanese hors d’oeuvres at Boulette’s. 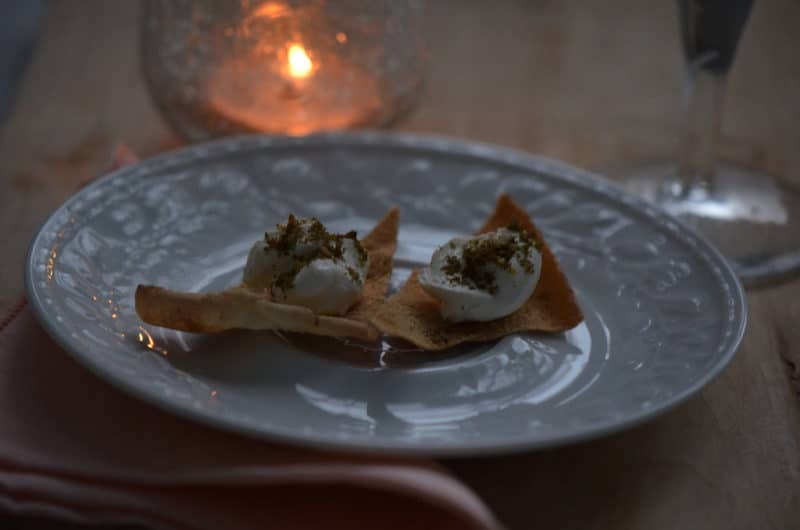 These were refined, passed appetizers, not hearty in the lusty way that Lebanese mezze is usually served and eaten—perfect for a more formal event where you want some savory little morsels to eat with a drink. The chef for the wedding has gone out of his way to stay true to the authenticity of our food, right down to procuring the thin-style pita bread for the pita crisps (which seemed much more reasonable than asking him to make talami and slice it thin for toasting). The wedding will be off to a wonderful start with our authentic Lebanese flavors, authenticity that translates to the kind of love that lasts a lifetime. Cut pita into 2” triangles and separate into one layer. Place on baking sheet and toast to golden brown, about 4 minutes for thin pita and 7 minutes for thick pita. Watch them closely because they can burn in a heartbeat. Place a dollop of labne on each chip. Drizzle with olive oil. Sprinkle za’atar over the top. Alternately, place labne in a small bowl and sprinkle with za’atar. 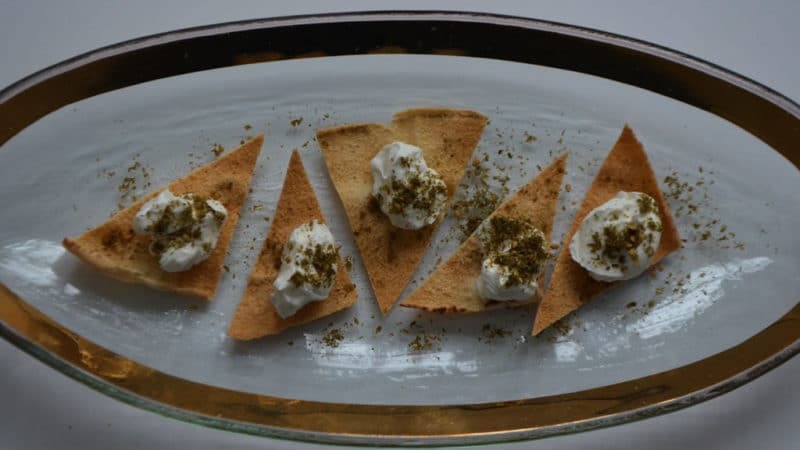 Place on a platter and surround with pita crisps, also sprinkled with za’atar, and serve as a dip. 16 Responses to "Pita Crisps with Labne & Za’atar"
What a clever idea to render everything bite size for appetizers! And, I have never had labne on pita chips with oil and za’atar. I am definitely going to try this! Blessed Wedding–Many years to the bride and groom! yum! this is my favorite snack, anytime! Of course, the zaatar and the olive oil have to be good! Great photos! Sounds wonderful and tastes even better. I do not know where in MN you will be, but my wife and used to live near South St Paul, there is a wonderful Lebanese resturant on Robert St. called Beirut. Very good food Keep sending the PC, Maureen, They are wonderful. Thank you Greg…wish I had time to try out Beirut restaurant! One word. Miam. I adore this mix. My favorite snack. Agree though that the olive oil and zaatar have to be excellent quality. I also like labne with olive oil and dry mint. 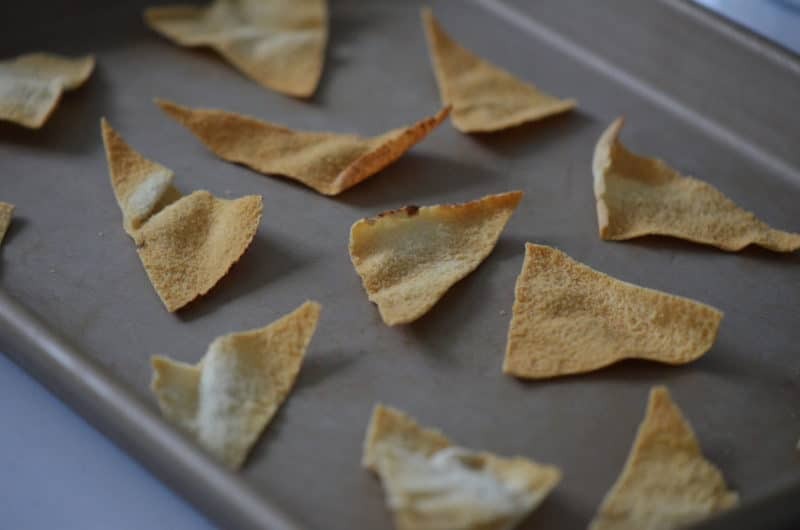 These pita chips with Labne are great…as you know. I do something a little different…maybe a little more for Super Bowl appetizers. I cut the pita bread as you do, and mix the Zatar with Olive Oil and spread on the bread. Toast as you did in the oven until golden brown……..Yummm…they are great that way or dipped in laban (the thinner version). Just thought I would pass on another option for your wonderful blog. Totally impressed with your Blog darlin. Love the idea of toasting the bread with the za’atar Janet! Thanks so much! I do the same but with summa’a and olive oil. I mix both and spread them on the pita pieces and then toast them. Try this. Delicious. Everything you write and photograph you do it in such a wonderful way… and you do have so much taste! Infortunately, here in Portugal, you can’t find za’tar, nor you can’t find sumac. I wish your brother and Amara a happy life together. Paula, thanks so much. 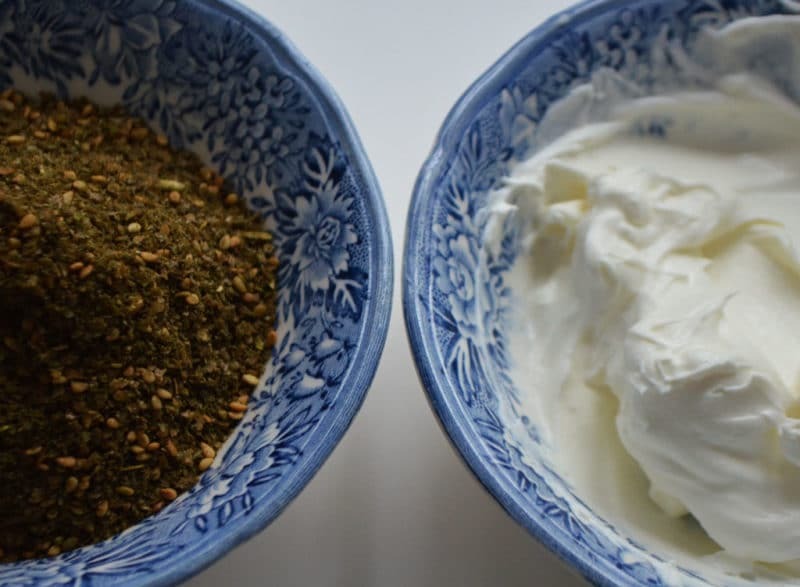 Everything you write you do in a wonderful way too… Send me your address and I will send you za’atar and sumac!! Maureen… I discovered your blog/website from your today’s comments on David Lebovitz’s post about he Za’atar farm. SO glad to find you and I shall be checking your blog often! I love to go to The Ferry Building in SF and visit La Boulette Larder for my spices. I shall be checking out their Za’atar! Margo, how wonderful, thank you so much! I love the thought of you getting your za’atar at Boulette’s, such a special place. Please keep in touch and also consider signing up for my emails (upper right side of the the homepage)!